I first met Jim Hamilton three years ago in 2009 in an attempt to convince him to be the preaching pastor at my church, Kenwood Baptist. He was intrigued and agreed to come preach for two Sundays and pray about it. Which text did he preach on as a candidate for pastor? Revelation 9 for the first and Revelation 10 for the second. Although skeptical at first (I say that with a smile), I was blessed afterward. When we called him as pastor a month later he preached through the entire book of Revelation in a little over a year. The sermons are outstanding and you can find them on Kenwood’s website here. He has preached through four more books since that time (Titus, Ezra, Nehemiah, Mark, and now Jeremiah), but the sermons on Revelation are favorites of mine. The sermons are now in manuscript form and part of the Preaching the Word commentary series. 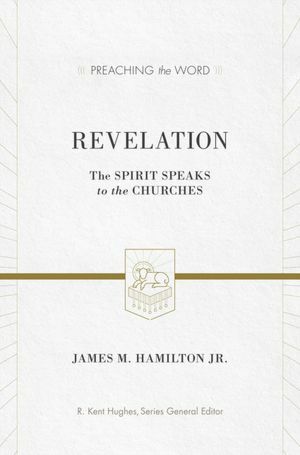 Revelation: The Spirit Speaks to the Churches is Jim’s newest book, and I’m thankful for the copy I have in my hands. Jim sets Revelation in a biblical theological context, combining exegetical precision with pastoral sensitivity. I’m grateful for his efforts in this regard. Jim communicates in a way that sticks, so to speak. I never left the pew on Sunday without having grasped both the meaning of the text in context and the need to “do” and apply. Jim is unique in this way. After all, who else do you know who would preach on the Seven Angels and Seven Plagues (Rev 15) on Christmas! I want to encourage readers to get a copy of this commentary, and you won’t be disappointed.